This is a continuation light color and design I. In the second semester, the course concentrates on the ways both historical and experimental, of manipulating the two-dimensional surface to explore its endless expressive and structural possibilities. 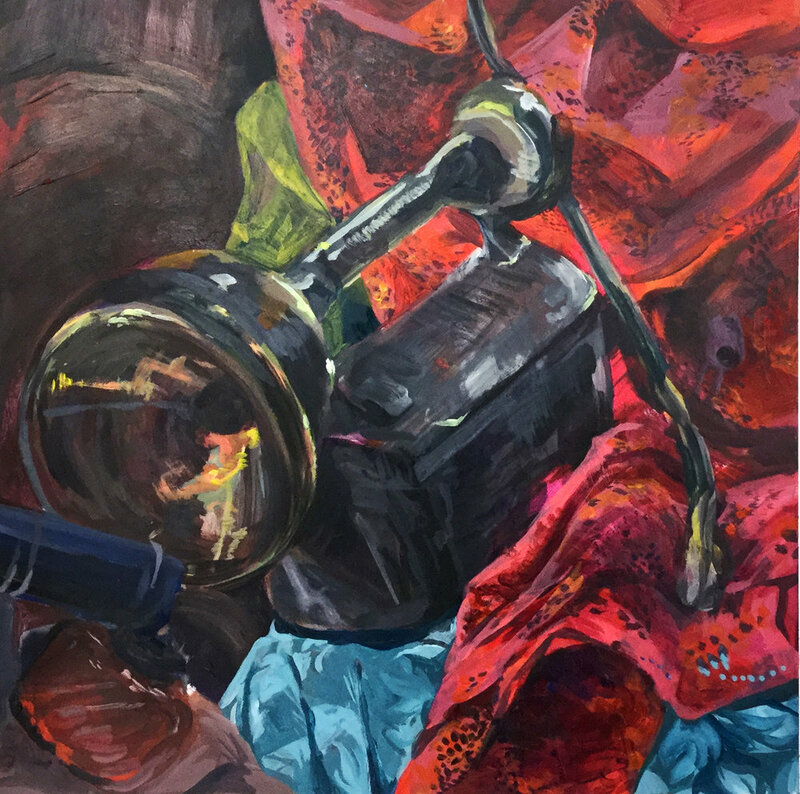 Students create a painting or drawing of a still life completed in one color. Students are asked to pay special attention to warm and cool variants of that color. The assignment goals are to concentrate on use of value, controlled tight brush stroke, and overall composition. Students paint a still life completed in full color. Students are asked to observe objects and their color relationships and values. Contrary to the previous assignment students are asked to loosen or exaggerate brush stroke. For this in class study, students examine the art movement Fauvism. Fauvists major contribution to modernism was separating color from its descriptive. Here students are asked to paint the figure from life. Rather than replicating colors they observe, students employ flat brush strokes and over-saturated colors. This project follows the artistic movement Expressionism. 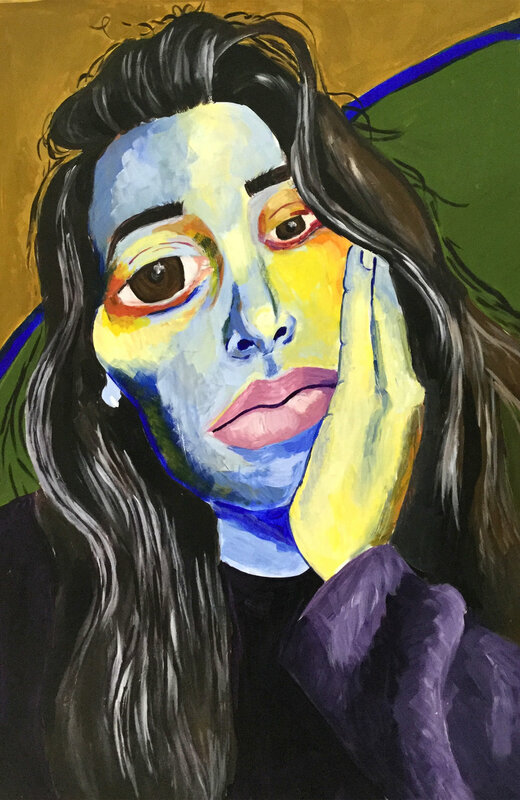 While utilizing a cool and dull color palette, students are asked to create a self portrait by looking within themselves. Students are encouraged to explore exaggeration in form and expression of brushstroke to evoke an emotional effect. Following analytical cubists Picasso and Braque students break a down a picture plane with geometric shapes and a linear construction. 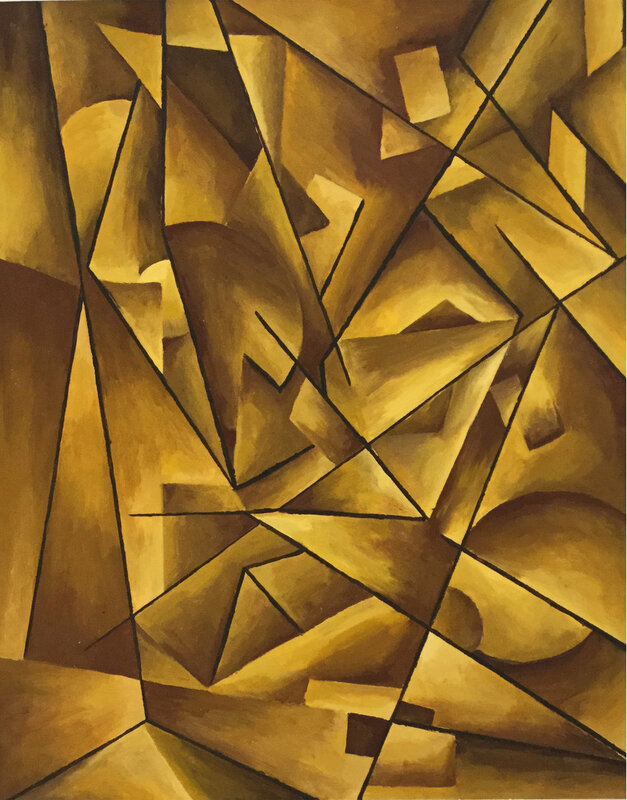 Students use a limited color palette of earth tones or Payne’s Grey with concentration on value transitions to help create a sensation of space. Student may find an object to break down of form, or students can completely abstract the picture plane. This assignment looks to experiment with mixed media, by marrying both painting and collage. Students are encouraged to create a surface that is uniform and difficult to decipher between the two mediums. Students study the movement Futurism. Futurist artists sought to create a sensation of motion in their paintings or sculpture. Through transparency, linear elements, and repetition students are asked to create a sense of movement or motion in a work of art. This project is a series of four paintings that begin with realism and slowly break down into full abstracted image in the fourth panel. This project helps students understand how to acutely observe the world around them as a guide into creating an abstracted image. 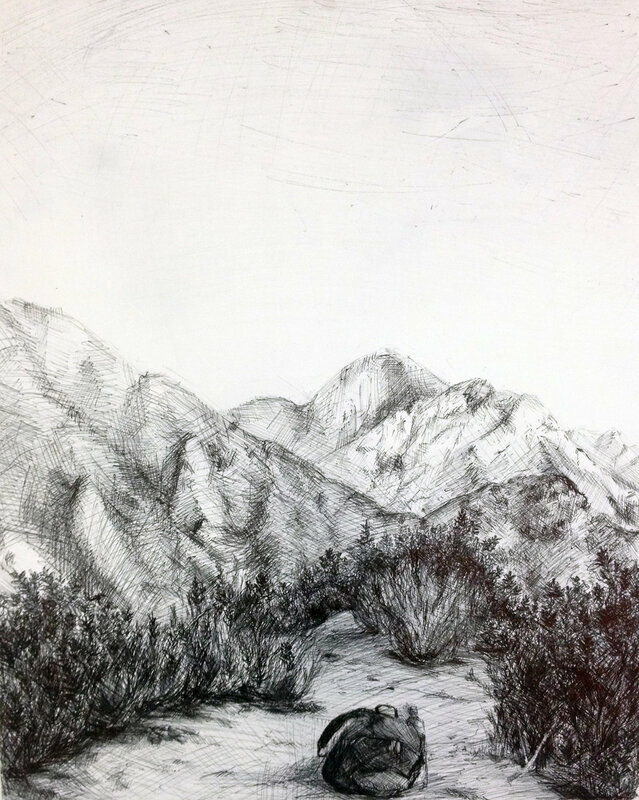 This project challenges students to draw with ink. The goal of the assignment is to empty the ink from a full Bic ball point Pen in one drawing. 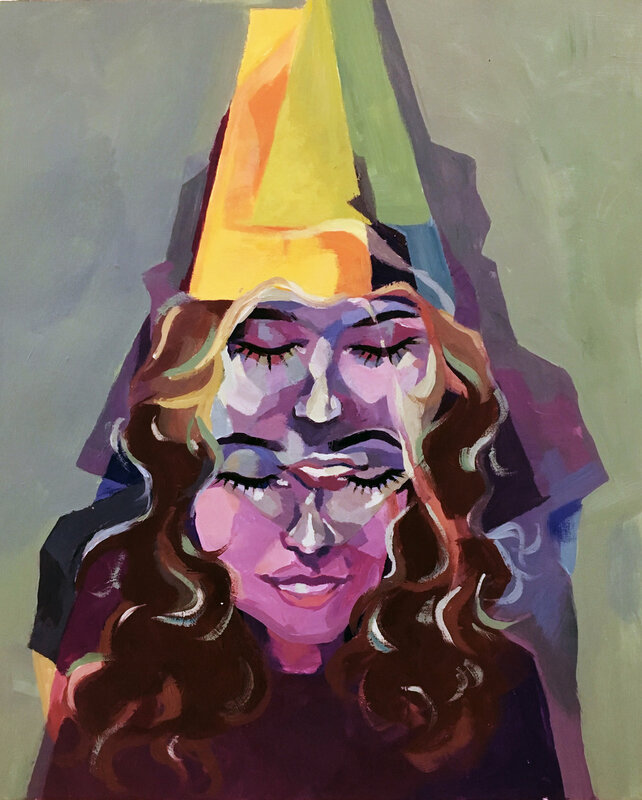 Artist took an abstract look into her identity within the LGBTQ community. Creating a sense of love, movement, and chaos with her current partner as subject matter. Student made her final based on a physical condition that she experiences on a day to day basis. She portrayed an claustrophobic, uncomfortable, or sometimes painful environment. The feeling of being closed within your own body. A student collaboration project that uses a collage like visual composition. Students in this project jointly decided to explore themes of body violence using a half male/female figures. Students also sought to explore different surface textures (body wrapped with saran wrap broken glass/glass surface). 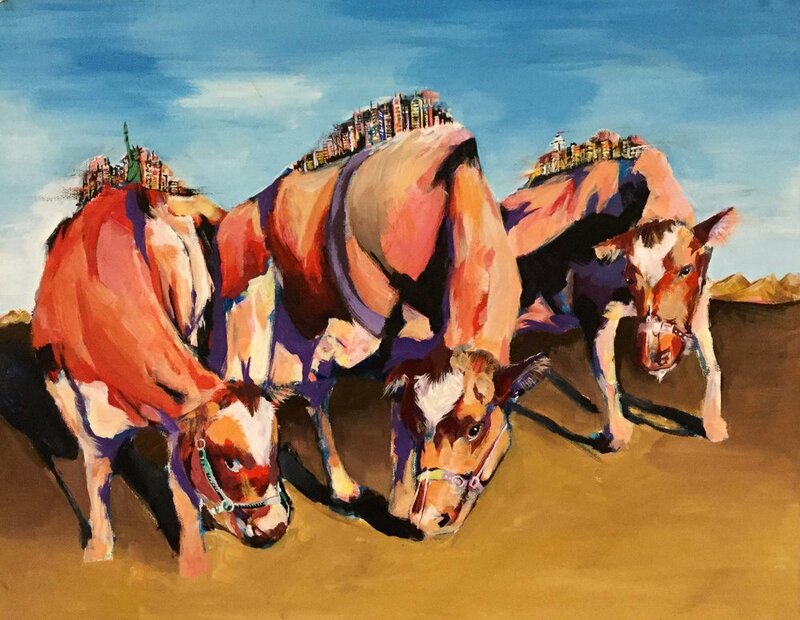 International student paints a form of self-portraiture as cattle. Each of the cattle carries an experience on his back: cities that shaped his identity. Tokyo, New York City, and Utica NY. Student appropriated vintage imagery of women into several collages. She made work to celebrate women’s accomplishments throughout history. Student made artwork based on memory and tradition of generational relationships among women in her family.